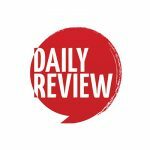 Melbourne's summer of pavilions - and the art of yakking | Daily Review: Film, stage and music reviews, interviews and more. When Melbourne discovered the Spiegeltent about 20 years ago it became so popular that replicas began popping up across the inner suburbs. Now summer pavilions — well, two anyway — have popped up within days — and a few hundred metres of each other. Both are designed by esteemed architects and each offers a summer season of talks and events about art and design. What is is about the southern city’s need to gather together in small spaces and yak? Architect John Wardle who has designed the inaugural “Summer Archictecture Commission” (SAC) for the National Gallery of Victoria tells us about his pavilion situated in the gallery’s backyard on St Kidla Road just across the road from the second annual MPavilion, this year designed by London architect Amanda Levete which opens to the public on Monday. What was the inspiration for your SAC design? The pavilion was designed with a C.J. Dennis poem ‘I Dips Me Lid’ in mind. The poem commemorated the opening of the Sydney Harbour Bridge in 1932. Playfully we transposed this to another ‘Sidney’ –the Sidney Myer Music Bowl, a structurally innovative design of its era, generously gifted in 1959 as possibly our most endearing and enduring civic place. Our structure is a doubly curved grid shell which has become somewhat an expression of our time facilitated by developments in computing technology. Gridshells are not necessarily new by any means; the grid shell was pioneered in 1896 by Vladimir Shukhov. However in the last few years there has been a lot of interest in this type of structure, primarily because we can now design, test and model the reactions very accurately. Fabrication has also developed and assisted by laser cutting technology and computer modeling. So in this way the installation is a humble reference to the technological achievements of these magnificent structures of their time. In the end it’s a reference to time and a setting for technological exuberance. Our ‘ceiling’ of repeated polypropylene formed elements, set to strong repeated and inflected geometries, act as another nod to our history — Melbourne being a place where great civic spaces have been defined by magnificent ceilings — Walter Burley Griffin’s and Marion Mahony Griffin’s Capitol Theatre and certainly Leonard French’s Great Hall being two such ceilings. Our pavilion we hope will create its own histories but in its inception draws on the histories of other places that have encouraged people to gather together. Is inspiration boosted or deflated by practicalities (eg materials, site etc)? We were inflated by the opening to new possibilities. The projects expected lifespan is about six months; we were able to use materials and assembly techniques we ordinarily wouldn’t use. Polypropylene was interesting to us because it is a relatively commonplace material, which we’ve used in an innovative way. To us, it was an opportunity to create a repetitive system that we were able to make a three-dimensional surface out of a flat plane. It is also interesting to give new life or expanded character to what may be otherwise fairly prosaic materials. We were approached by the NGV to complete a temporary installation within their Grollo Equiset Garden. 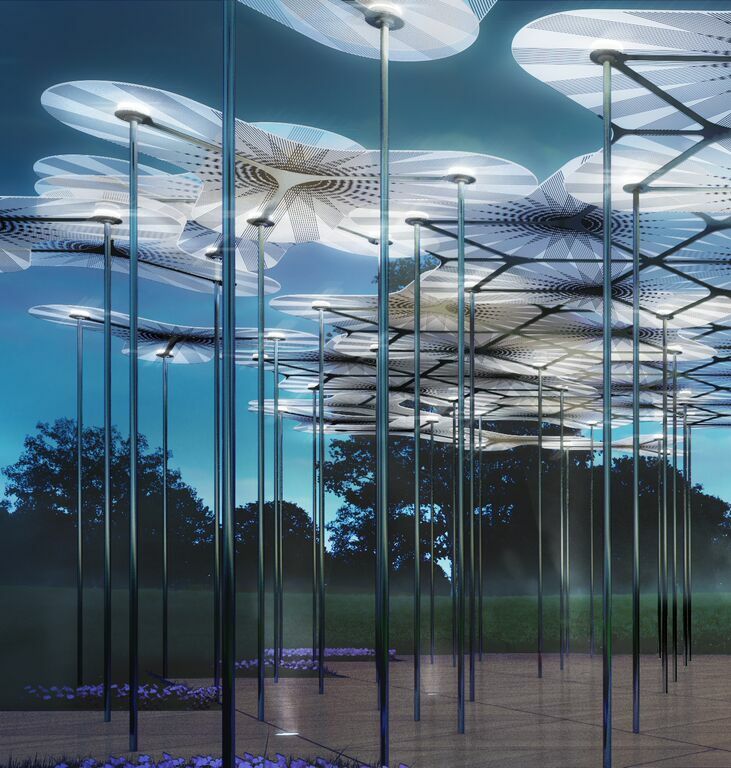 Originally, the brief was to design a small bandstand and shade structure to accompany a summer music program. After realising the greater complexity and possibilities of a project of this nature, the NGV wove it into a larger program and the project has evolved over time. Ours is the inaugural commission of an ongoing annual series of ephemeral Summer Architecture Commissions to activate and explore the possibilities of the NGV’s “backyard”. It is now fascinating looking back over a project that has developed over so many conversations to realise that its inception was simply stated as a wish by the NGV to showcase architecture and draw interest to one of Melbourne’s less utilised public spaces; their backyard. Did you deliver what the NGV wanted or was it more collaborative? As a client, the NGV have been fantastic; they have not restricted us in any way and allowed us to design the project so that it can be the best it can be. A budget was set after the first conceptual ideas were tested and it has been met. As such they have been designing their curatorial program around it and responding to it and the possibilities it brings and conversations it provokes. Some include talks around plastics and material innovation which is an outcome of our use of material. How important was Melbourne’s weather in designing the structure? The selection of a translucent material ultimately makes the most of Melbourne’s variable weather, the movement of light through the day and at night is saturated by the colour of the pavilion. It is however a shade structure, an optimistic gesture with Melbourne’s spring and summer weather. We have noticed that with the one rain shower to date, the polypropylene ‘ceiling’ produces some wonderful water patterns. Did acoustic considerations play a role in the design? Not directly however the double curvature of the grid shell is the archetypal form of a sound shell which performs acoustically. Otherwise, we imagine that the noise that we hope will be generated within it will be unrestrained and fill the garden. Our initial form studies we presented to the NGV were in pink, the colour was so compelling it stuck. As it was to be a structure that was to pronounce the start of spring and only last until autumn, we applied some of the colours of both seasons; this is one of the reasons for the inclusion of purple and orange. There seems to be revival of public outdoor rotundas, gazebos, pavilions, call them what you will… do you have any theories as to why? There does seem to be a revival, here and around the world. It is just as well as our city, like so many, have been living off the largess of the nineteenth century and earlier times for such important civic places. You will be across the road from MPavilion. Whose idea came first? Chronologically the MPavilion first opened in October 2014, ours has opened September 2015 and the MPavilion will once again open on October 5 with Amanda Levete’s remarkable structure. Is this town big enough for two summer pavilions? Melbourne is a city of significant participatory cultural activity. To have these structures exist within our public domain is an uncommon and welcome occurrence. The success of these structures lies within the public programming to activate them and position them firmly within public consciousness over their short life span. In this way the structures are experienced by a board audience who have interests aside to architecture and we hope will create their own memories and stories. From what you know about MPavilion this year — how is it different to yours in its approach? In some ways they are indeed similar, both have a nod to contemporary technology however with a distinct handmade element. The MPavilion’s carbon fibre roof petals are a composite material which we imagine would have been layered up by hand, ours is lined with hand folded and eyeleted polypropylene shade elements; for all our technology the human hand is still evident in these processes. This exposition of technology and registration of human endeavor interests us greatly. Was the proximity of your SAC to the MPavilion a factor in how you designed yours? They both have quite different contexts and respond accordingly, the design of these projects takes considerable time — at the time we had no idea what the MPavilion might not look like nor who the designer might be. We were guided by our brief and the specific constraints of the site and the input of many, particularly John Bahoric the engineer and Ewan McEoin and his team at the NGV. What will happen to yours after its season is over? We are not absolutely certain other than the NGV’s imperative for it to have a life beyond this short time span. Its further life may be one of complete relocation or one of repurposing with adaptive reuse of the structure and recycling of the polypropylene back into everyday items such as book covers and the like. The lineage of reuse and repurpose is a good outcome.